Just as millions of students head back to college, comes word of an important research study that all female students should be aware of, before they head out to bars and dorm parties. In a study just released in the August 28 Journal of the National Cancer Institute, researchers from Washington University School of Medicine in St. Louis have determined that there is a link between drinking alcohol in the years between adolescence and first full-term pregnancy, and increased risk of breast cancer. Scientists have known for years that alcohol consumption increases a woman’s risk of breast cancer. Health professionals recommend that all women limit any alcohol to one drink per day, or less, as the risk increases dramatically after that. However, this is the first study which links risk of breast cancer to younger women who drink. This research determined that females who average one drink per day between their first period and their first full-term pregnancy, increase their risk of breast cancer by 11 percent. Researchers also noted that for every drink consumed daily, a young woman’s risk of proliferative benign breast disease increases by 15 percent. Although this is a noncancerous condition, its presence increases breast cancer risk by as much as 500 percent, according to study first-author Ying Liu, MD, PhD, a Washington University School of Medicine instructor in the Division of Public Health Sciences. In addition, researchers determined that the more women the women studied drank, the more their risk increased. Breast tissue cells are particularly susceptible to cancer-causing substances as they undergo rapid growth during adolescence, so it’s important to limit exposure especially at this age. 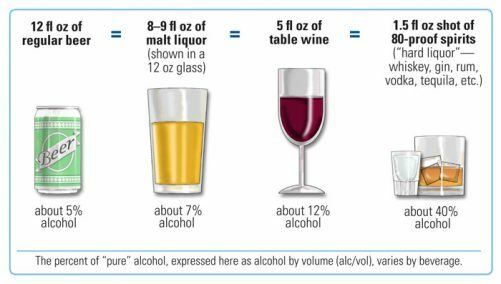 If you’re a woman who drinks alcohol, please take the time to assess how much alcohol you drink, and stay within the “one drink a day” (or less if you are young) guideline. To learn more about breast cancer risk visit The American Cancer Society.